For Cheap Insurance Car premiums in all 50 states, along with top schools, American culture, and more, visit any if the links shown below. Or scan this page for auto insurance quotes, rates, facts, laws, and statistics, as well as hints on how to score the best possible deal on car insurance in Washington DC. According to laws specific to the District of Columbia, the minimum required auto insurance coverage per car includes basic liability coverage, as well as five thousand dollars in Uninsured Motorist protection (UMI). UMI covers a policyholder who's car is hit by either an uninsured vehicle or a driver who flees the scene. The minimum required liability coverage in Washington DC is 25/50/10 per vehicle. However, even these amounts frequently fail to cover the costs of a real accident. That's why the Insurance Information Institute urges all motorists in America to buy 100/300 coverage per vehicle, as well as $50,000 in coverage against property damage. Still, most DC drivers remain underinsured, and at least 13% of vehicles on roads in DC, Maryland, and Virginia are uninsured altogether. That's one reason why UMI is required in this region. The penalty for getting caught driving an uninsured vehicle in Washington DC is a fine of up to $2,500, along with a suspended license. Later, you would also have to pay reinstatement fees. Uninsured driving convictions also result in raised car insurance premiums. 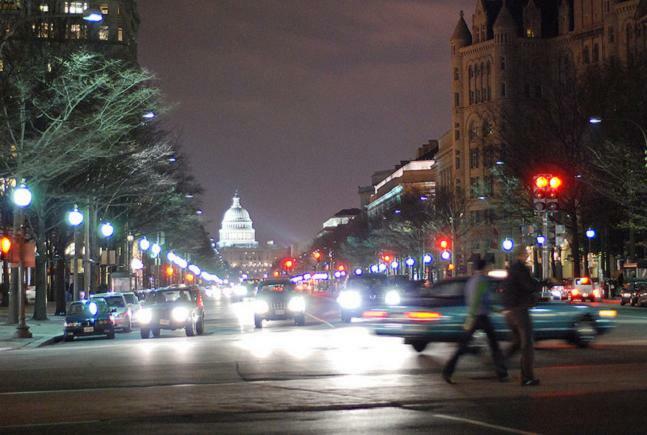 Premiums on car insurance in Washington DC are first based on site-specific factors such as climate, economy, traffic congestion, crime rates, and other influencing factors. Also affecting annual premiums are the driver's age, gender, marital status, driving record, credit history, and car make, to name just a few. The Average Annual Car Insurance Premium in Washington DC was about $1,827 this year, according to data from insure.com. This figure flies high above the overall national average of $1,365 for the same time period. DC's lofty premiums may be a result of the area's high above average population density, and high above average crime rate, as well as a relatively high rate of uninsured drivers. One creative way to reduce the cost of auto insurance in Washington DC is to purchase your policy in Maryland, where the average rates are lower. As well, the Maryland Automobile Insurance Fund (MAIF) provides assistance to drivers who are unable to get car insurance. Their programs include the Uninsured Division, which is funded mainly by penalties and fines imposed on uninsured Maryland drivers. Car insurance premium rates are further slashed by combining discounts. For instance, car insurance providers offer a full range of discounts for safe drivers, smart drivers, senior citizens, good students, drivers who buy more than one policy, and drivers who own more than one car, among others. Finally, certain types of cars are cheaper to insure than others. You do not need a Ferrari. A better cheap insurance car would be a standard, slightly used passenger vehicle, with safety features installed. Still, many DC drivers opt for smaller cheap insurance car companies, such as Erie Car Insurance or The Advantage Group. Overall, DC supports many car insurance carriers who offer adequate coverage at competitive rates. Call around and inquire. Ask about their discount programs! Compare quotes. Then just pick the policy that offers you the best deal.